Photo by Worapol Sittiphaet and used here with Creative Commons license. For cord cutters, everything old is new again — at least when it comes to using an antenna to pick up free, over-the-air (OTA) TV. As a growing number of people become tired of the rising costs of cable TV and all of the other hassles that come with it, many are cutting the cable in favor of streaming TV and OTA TV. Unsurprisingly, antenna sales have increased in recent years, with retailers like Antennas Direct reporting huge spikes in sales numbers. "Simply put, it’s cool to have an antenna again." Simply put, it’s cool to have an antenna again. 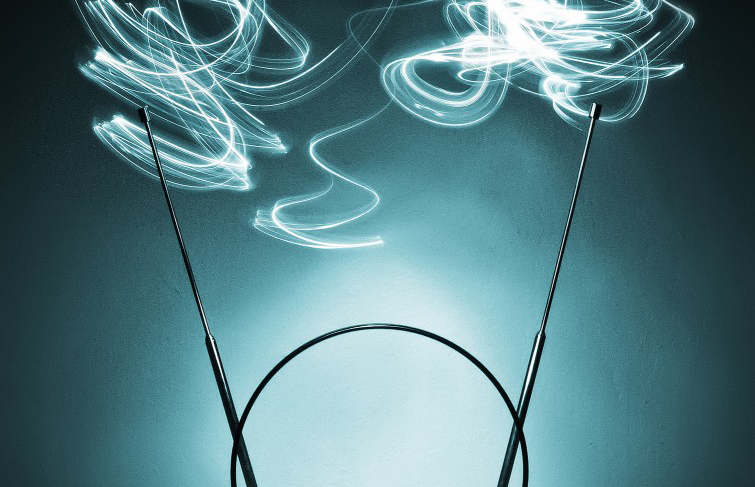 If there’s one drawback to dusting off the old bunny ears, however, it’s that setting up your indoor antenna properly to pick up all of the stations in your area in crystal-clear HD can be challenging. After broadcasters made the switch from analog to digital back in 2009, finding a signal became a little trickier. That’s because with a digital signal you either get a clear picture or no picture at all. For those who aren’t allowed or are unable to install an outdoor antenna on their roof, that means putting the antenna in just the right spot is more critical than ever. Even the newer, more advanced “flat” antennas that are multi-directional and don’t have to be “pointed” at a precise angle, like the highly-rated, popular Mohu Leaf, can still require a little work to get positioned just right to pick up the best signal possible. Thankfully, there are some simple tips and tricks that will help you get optimal reception with your indoor antenna. 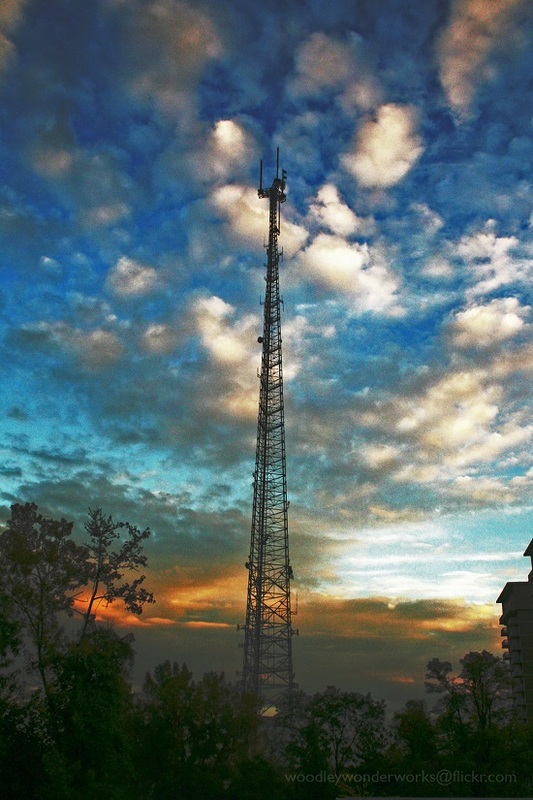 Aiming your antenna at TV transmission towers can improve reception. Photo by woodleywonderworks and used here with Creative Commons license. The first thing you need to do before even attempting to set up your antenna is to identify the locations of the broadcast towers in your area. Ideally, you’ll do this before you even buy your antenna because this will help you better understand how powerful the antenna will need to be to pick up the stations you want to watch. There are a couple of excellent websites for locating TV signals in your area – TVFool.com and AntennaWeb.org. Either of these online tools will allow you to input your street address and see a map outlining the distance and direction of the various broadcast towers in your area. 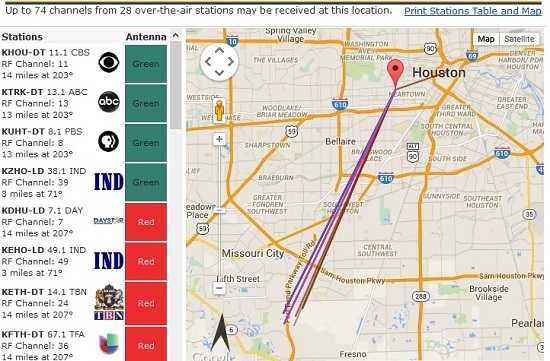 This AntennaWeb report shows that most of the transmission towers are located southwest of the home. Why does this matter? Let’s say you’re having trouble picking up your local NBC affiliate. Using the map, you can see which direction the tower is located in and move the antenna to the outside-facing wall that faces that particular tower. It can also tell you what strength antenna you’ll need to pick up the channels in your area. For instance, if most of the towers are within 30 miles, an antenna with a 30-mile range should work. However, if you live further away from the broadcast towers, you might need a more powerful antenna with a 50-mile range or more. The fewer obstructions between your antenna and the broadcast towers, the better. And make no mistake–thick walls and ceilings are certainly obstructions. That’s why placing your antenna in or near a window often yields the best results. Many times, this can give you the clearest line of sight to the broadcast tower, provided there isn’t a major obstruction right outside of the window, such as a big tree or your neighbor’s brick wall. A couple of important notes about placing your antenna in a window. First, beware of heat absorption from the sun. With the Mohu Leaf, the manufacturer recommends making sure “the white side faces outside so the antenna absorbs less heat from the sun.” Also, if you’re using a flat antenna, make sure you securely tape all four corners to the window so that it doesn’t bend or warp over time as this will hamper reception. One of the things you’ll notice when you use the signal finder tools on TV Fool, AntennaWeb, or other similar sites is that you’ll be asked to input the estimated height of your antenna. There’s a very important reason for this. Typically, the higher your antenna is placed, the better your reception will be. That’s why outdoor antennas tend to pick up so many channels. With that in mind, you should try to place your antenna as high as you can in your room (keeping in mind that you still want it near an outside-facing wall and by a window, if possible). In some cases, such as when the TV is down in a basement or broadcast towers are far away, this may mean placing the antenna up on a higher story or even in the attic, and it may require a slightly longer coaxial cable. Just make sure that you don’t get an unnecessarily long coax cable because long cable runs can degrade the signal. Metallic surfaces near your antenna can cause interference with the digital signals and block your reception. For example, if you place your antenna in a window but there are metal burglar bars or a metal bug screen just outside the window, this could cause issues. Likewise, if you have a metal roof in your home, installing your antenna in the middle of the attic probably won’t yield positive results. “Try to keep as much distance as practical from these [metal] objects (6 feet or greater is ideal),” Antennas Direct recommends. While it would be nice to plug in your antenna and immediately start picking up every channel in your area in beautiful HD, the fact is you’ll probably have to test a few different locations for your antenna until you can find the position that offers the best results. Using the tips in this article, try out a few locations in your home. Each time you place the antenna in a new spot, run a channel scan on your TV and see which channels are picking up. If you’re using a flat antenna, I recommend using clear adhesive tape to temporarily place the antenna when running your scans. With a little research and some patience, you should be able to get great reception with your indoor antenna. Steve Belk is on a mission – to show people just how easy it is to cut the cord and get rid of cable. His website, Cut Cable Today, offers an easy-to-understand, step-by-step guide for getting rid of cable once and for all. You can follow Steve on Twitter @CutCableToday. Although it’s axiomatic that with digital broadcast TV “you either get a clear picture or no picture at all,” my experience with digital antennae in the last few years puts the lie to that popular notion. I live in Hollywood, the heart of the metro Los Angeles area, which is saturated with broadcast TV signals from relatively nearby transmitters. But because I live in an apartment on the 4th floor overlooking the inner courtyard of a 5-story building, there seem to be countless complexities and reflections in the digital signal environment, resulting in marginal reception for many stations. This means an unstable and unpredictable signal on any given day at any given hour. So, frozen images, weird image mashups from different points in time, digital mosaics, artifacts and intermittent dropouts to black are common, routine even, in my TV viewing. As is constant and continual readjustment of my state-of-the-art flat leaf antenna, to which I’ve worn an analog path in my carpet to the sliding glass balcony door where the temperamental antenna is closest to being happy, but never permanently so. Nevertheless, despite all the frustration and hands-on attention this situation entails, IT STILL BEATS PAYING OUTRAGEOUS INFLATED FEES TO TIME-WARNER CABLE FOR SUCKY, INSOUCIANT SERVICE AND AN INFERIOR PRODUCT WHICH OUR NON-COMPETITIVE OLIGOPOLY ENVIRONMENT HAS CREATED!! There is no turning back now. The invasion of the flat antennas has begun. Long live Get TV, This TV, Cozi TV, Bounce!, Movies! TV Network, Escape TV, Grit TV, and their digital multicast substation brethren which are even now subverting the cable conglomerates that refuse to acknowledge most of them. The revolution is nigh! had a problem not getting CBS and ABC. Occasionally they would come very spotty and then disappear. I live in Northern Virginia in an apartment and am 18 miles (as the crow flies) from the TV transmitters and have a 50 mile amplified Mohu Leaf antenna. Place the antenna in the best possible location in the house (yes CBS and ABC still don’t come there or they come spotty). Then I took an old 3 pin audio-video cable (one with the Red, Yellow and White pins on either ends which we used to connect to a VCR in the good old days!) and inserted the two red pins into two tiny holes on either side of the antenna. Actually Mohu Leaf antenna already has two pinholes to hang it on a wall, I pushed the Red pins into those. Voila! it worked and with amazing clarity. I get ABC, CBS with super strong signal and stability. Even the other channels that I was already receiving are significantly more stable now. Well the reason this hack worked is because of the copper wire in the AV cables which pulled in weak TV signals closer to the antenna. If you don’t have a AV cable use a simple electric wire to push into those two pinholes. Did you puncture new holes or simply “plugged” the RCA into the pre-existing holes in the Mohu leaf? Good great results by covering the backside (away from broadcast antenna) with sheet metal. Just enough to cover the antenna. Got good results backing the antenna up with sheet metal. Thank you for posting – this little addition helped me quite a bit also. I am happy it worked for you and others. Another factor I figured that affects the reception is the “vertical alignment” of the Mohu antenna. if the surface of the antenna is plumb vertical (i.e perfectly parallel to your face) the reception is poor. If you incline it slightly the reception is far better. With this method I don’t need the ‘3 pin audio-video cable ‘ hack. For some reason when i put my indoor digital antenna near a window it gets horrible reception. Ive funny enough found the best spot is hanging from my front door handle of my metal door. Why is tgat?